I didn't see how art is directly tied to healing until I placed my art in a brand new Breast Center for Women in Santa Rosa, California. The fact that this wing of the new North Bay Facility is the Breast Center is significant. My friend Nancy Witherall is a breast cancer survivor, and curator of the space. Nancy has been through the life altering process and knows intimately how having art in a room can support, ground, and visually anchor a woman’s journey. When the last piece was hung in the dexa room she took me on a tour of the facility from the perspective of a woman being diagnosed with breast cancer. Each room’s significance in the process was explained, what they did there, how long a woman was waiting in this room for news. I was shocked. It became real. I was amazed as she was by how art can hold a space. She knew. She approached this project with this in mind and that is why it is so successful. 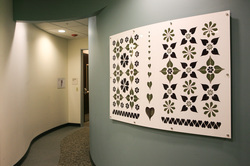 I thank Sutter Health for having the vision and budget to facilitate art holding space for healing.